Patrick Welch showed once again why he's the best shooter in the NHIAA on Tuesday night, as the sophomore guard drained 8 three-pointers en route to a game-high 31 points in an 80-59 win for Pembroke over Coe Brown. "I just get as many shots up as I can and do light dribbling every day" said Welch when describing his workout routine. "In the 2nd half we got looks against their zone when Rene drove we just had to step in and shoot it." It was an impressive win for Pembroke, who improves to 6-1 on the season (9-1 including the holiday tournament). 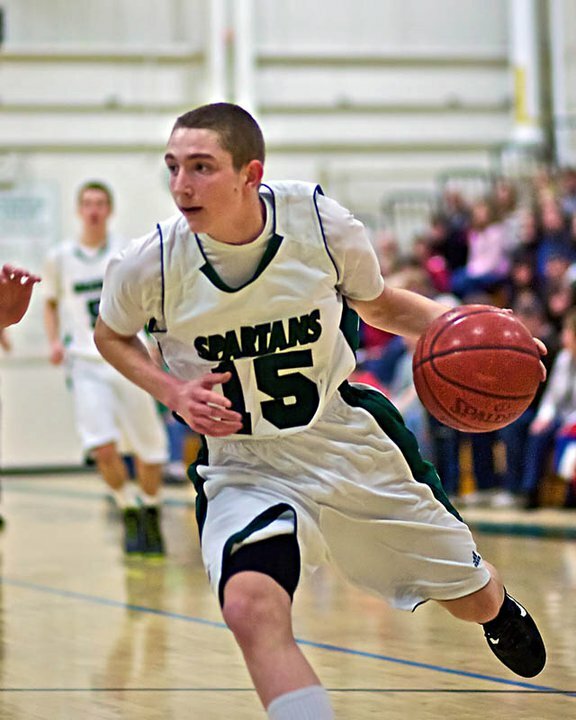 Point guard Rene Maher had 15 points, 6 assists and 4 steals, while Matt Persons had 14 points for the Spartans. Pembroke actually trailed in this game 32-30 at halftime, but they put up 50 points in the 2nd half. 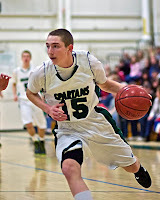 Welch also dropped 31 on Concord over the holidays, and his career-high is 34 (last year vs. Pelham). Pembroke head coach Matt Alosa is one of the best players to ever come out of NH, but Welch actually scored 5 more points in his freshman season last year than Alosa did in his. "We tried to play zone and just extend our defense on Welch" said Coe Brown coach Dave Smith. "But you can't focus too much on him because the other guys will hurt you. I thought Persons hit a couple big shots at critical times." Smith's team battled hard all game. In the 1st half it was anyone's game, as Darren Doyon, Tom Darling and Josh Jackman were all playing well for the Bears. They were doing a nice job of breaking the Pembroke press, and even got baskets off of it at times. Late in the 2nd quarter Darling and Jackman connected on back-to-back threes to put Coe Brown up 32-28 - the home crowd at Coe Brown was really rocking at that point. Maher then made a great effort inside, battling for a rebound and getting a tough 2 points as Pembroke went into the locker room down 32-30. "In the 1st half we got them to play our tempo" said Coach Smith. "We can't run with them, match them shot-for-shot, so we had to slow it down a little bit." Then as soon as the 2nd half started the Spartans went on a run, took control of the game and never looked back. Maher hit a three just seconds into the 3rd quarter. Then the next time down the floor Persons connected from beyond the arc. Then Welch got fouled while shooting a three and hit all 3 free throws. Just like that Pembroke scored 9 points in under a minute, and went from being down 4 to being up by 7, 39-32. "We jumped on them to start the 2nd half" said Pembroke coach Matt Alosa. "On defense we made them rush things and then we changed up our zone offense and had better shot selection in the 2nd half." The offensive barrage just kept on rolling. After another three by Persons Pembroke went up 46-36, as they scored 18 points in 4 minutes! Then Maher made a nice drive and dish to senior forward Tyler Morrison for 2 points, followed by a three by Welch. On the next time down the floor Welch made a nice drive and finish in transition, twisting his body in mid-air at the rim to avoid the defender while still making the shot. That put PA up 53-41. Pembroke just kept increasing their lead, but Coe brown refused to give up. They just kept on playing hard, especially Doyon who had a tremendous performance in the loss for the Bears. Doyon ended up with 23 points, 9 rebounds and 5 steals. He played a great all around game, on both ends of the floor. He took it hard to the rim, was tough inside and jumped in the passing lanes on defense. Doyon reminds me a lot of Curtis Arsenault from Berlin, which is high praise considering Arsenault is one of the top players in the state. "He's been a steady player for us" said Coach Smith. "He gives us strength inside." It should also be noted that Coe Brown was playing without 2 starters in this game. Forwards Skyler Mitchell and Chris Laurion are both out with ankle injuries. According to Coach Smith Mitchell could miss up to 2 more weeks, while laurion could miss the rest of the season. Tonight was also the first game back in the lineup for junior guard Damon Doyle, who had missed a couple weeks with an ankle injury of his own. He too had been starting before going down. Considering all of those injuries it is very impressive the way Coe Brown played tonight against a very good Pembroke team. "They're going to be dangerous come playoff time" said Coach Alosa. Meanwhile it looks like Portsmouth and Pembroke continue to separate themselves from the rest of the pack in Division II. They were the 2 favorites coming into the season, Portsmouth is unbeaten while Pembroke's only loss came on opening night to Portsmouth in a 57-56 thriller. "I hope we see them again" said Alosa. "We're a different team now."